The Commonwealth Air Training Plan Museum is an aviation museum located at Brandon Municipal Airport, Brandon, Manitoba. 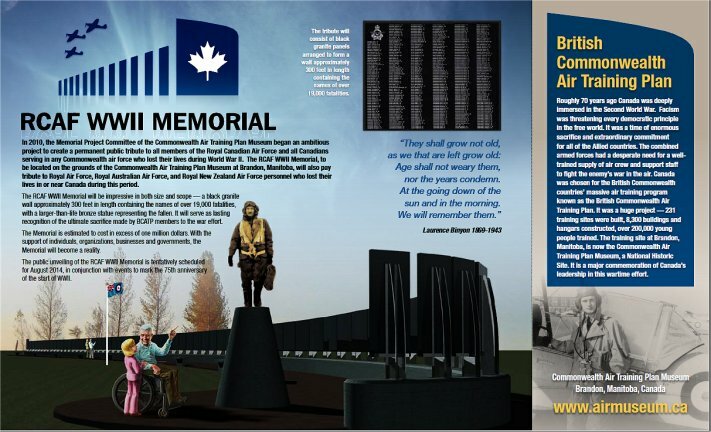 It is dedicated to the memory of the airmen from the British Commonwealth Air Training Plan, who trained at World War II air stations across Canada. The museum in stage 1 of redevelopment, which will see it restored to include the main hangar, medical building, chapel, H-hut aircrew barracks, motor pool building, canteen and interpretive center. The museum contains several World War II aircraft, displays of navigation, pilot, bombardier, ground crew and transport equipment, various artifacts and a gift shop. The Commonwealth Air Training Plan Museum is on the Canadian Register of Historic Places. 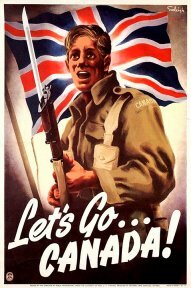 The British Commonwealth Air Training Plan (BCATP; "The Plan"), known in some countries as the Empire Air Training Scheme (EATS), was a massive, joint military aircrew training program created by the United Kingdom, Canada, Australia and New Zealand, during the Second World War.BCATP/EATS remains as one of the single largest aviation training programs in history and was responsible for training nearly half the pilots, navigators, bomb aimers, air gunners, wireless operators and flight engineers who served with the Royal Air Force (RAF), Royal Australian Air Force (RAAF), Royal Canadian Air Force (RCAF) and Royal New Zealand Air Force (RNZAF) during the war. 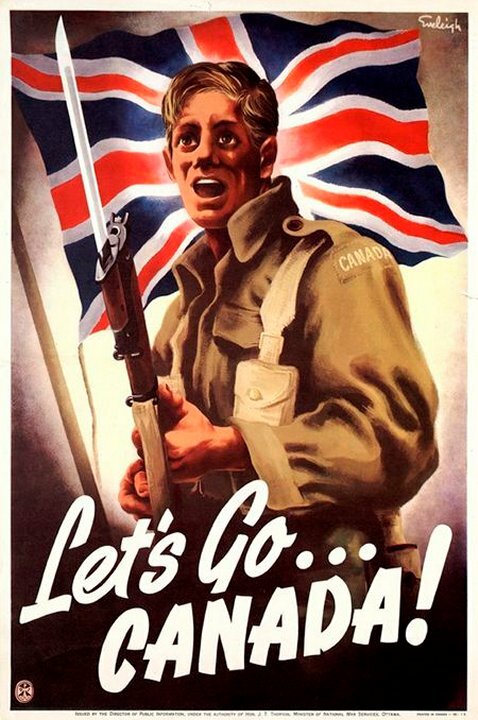 The British Commonwealth Air Training Plan illustrated that the Commonwealth still had some military meaning during the Second World War and was one of Canada's major contributions to the early war effort. The BCATP was an impressive and uniting national achievement. Canada became, during the Second World War, one of the great air training centres contributing more than 130,000 trained aircrew to the Allied Cause. The federal government paid three-quarters of the total bill, an amount in excess of two and a quarter billion dollars. On the third anniversary of the British Commonwealth Air Training Plan, in a message ghost written by Lester B. Pearson, serving at the Canadian legation in Washington, US president Franklin D. Roosevelt enthused that the BCATP had transformed Canada into the "aerodrome of democracy", a play on his earlier description of the United States as "the Arsenal of Democracy." Various aircraft, transport and training artefacts may be seen at the Commonwealth Air Training Plan Museum, located in Brandon, Manitoba. As Canada was the main participant, the legacy of the plan there included a strong postwar aviation sector and many new or improved airports across the country, the majority of which are still in use. The classic BCATP airport consisted of three runways, each typically 2,500 ft (760 m) in length, arranged in a triangle so that aircraft could always land (more-or-less) into the wind – that was critically important at a time when most light training aircraft (such as the North American Harvard) were taildraggers, which are difficult to land in strong cross-winds. 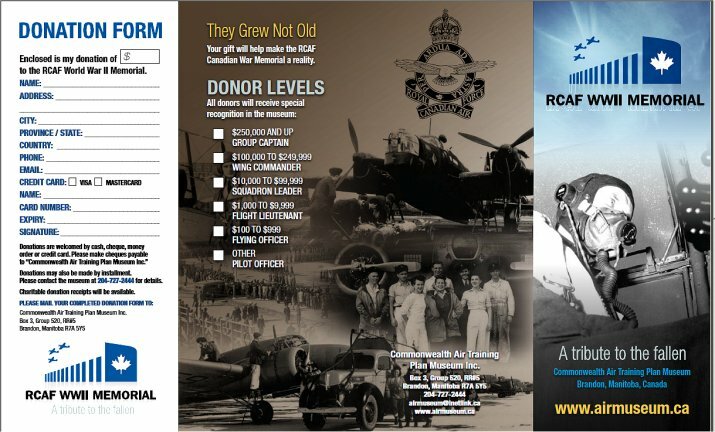 The BCATP provided an enormous and continuing economic boost, particularly in the Western provinces that were still recovering from the decade long depression.The final report of the BCATP Supervisory Board calculated that “more than 3,750 members of the RAF, RAAF, RNZAF and Allied nationals under RAF quotas married Canadian girls,” many of whom remained in Canada to raise families. The Commonwealth Air Training Plan (CATP) Museum is a non-profit, charitable organisation in Brandon, Manitoba, founded and operated by volunteers. The museum is dedicated to the preservation of the history of the British Commonwealth Air Training Plan and serves as a unique memorial to those airmen who trained and served, and especially those who died, while serving their country in the air war of 1939–1945. This is the only museum in the world dedicated solely to this goal, located in Manitoba where so much of the training was carried out. The collection includes 14 aircraft on display with the museum's Auster, Harvard, Cornell and Stinson HW-75 airworthy. The Commonwealth Air Training Plan may also be regarded as the precursor of post-war international air training schemes in Canada, many of them involving personnel from other NATO powers.] These include the NATO Air Training Plan (1950–1957) that graduated 4,600 pilots and navigators from 10 countries. Later bilateral arrangements with individual NATO powers (1959–1983), the Military Training Assistance Plan, which has trained aircrews from developing countries since 1964 and NATO Flying Training in Canada (NFTC), since 1998, a partnership of the Canadian Forces, Bombardier Aerospace Corporation and participating air forces. 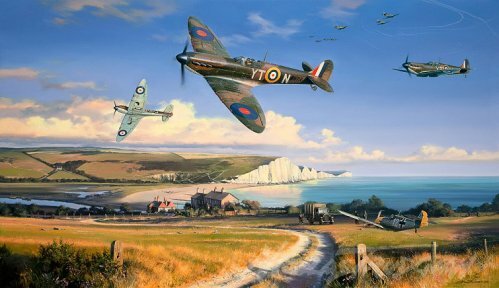 The airmen who Churchill dubbed “the few” comprised 2,353 pilots and air crew from Great Britain and 574 from overseas. All flew at least one authorized operational sortie with an eligible unit of the Royal Air Force or Fleet Air Arm from July 10 to October 31 and were awarded the Battle of Britain clasp to the 1939-45 Star. Five hundred and forty-four lost their lives. More than 100 Canadians are deemed to have participated in the Battle of Britain, and 23 lost their lives. A Royal Canadian Air Force squadron fought during the Battle; No. 1 (Canadian) Squadron, whose pilots were from both a regular force unit and an auxiliary unit, became operational on August 17, 1940. It was known as “Canadian” to distinguish itself from the RAF’s No. 1 Squadron but in February 1941 it was designated 401 Squadron. Three members of No. 1 (Canadian) Squadron received the Distinguished Flying Cross for their efforts during the Battle of Britain: the commanding officer, Squadron Leader Ernie McNab; his second-in-command, Flight Lieutenant Gordon Roy McGregor; and Flight Officer “Dal” Russel. Many more flew with other RAF squadrons – as well as Bomber and Coastal Commands providing support to operations to prevent the German invasion. An untold number served as ground crew, keeping the fighters flying. “Ground crews who serviced No. 1 (Canadian) Squadron’s Hurricanes, sometimes under fire and routinely under pressure, received belated recognition in June 1942,” says Halliday, “when Flight Sergeant John R. Burdes was awarded a British Empire Medal and Flight Sergeant Cecil M. Gale was mentioned in dispatches. Replacing experienced pilots throughout the Battle had been a significant challenge, especially in the early days of the Battle. Later in the Battle replacements became less of an issue, but the pilots became exhausted and replacements were less experienced. The Battle of Britain would not have been won without the contribution of another Canadian: Max Aitkin, Lord Beaverbrook. In the month before Beaverbrook’s appointment, 256 fighters were produced. In the critical month of September, as RAF losses reached their height, Beaverbrook’s system produced 465 fighters. And now, with the Nazi’s plan to invade Britain in tatters, another key Canadian contribution to the war in the air would begin to show its effect. By the summer of 1940 the supply of experienced Canadian pilots needed for flying instructors and for miscellaneous flying duties was nearly exhausted and the RCAF looked south of the border for a fresh supply. As the United States was not at war American pilots had to be "smuggled" into Canada through a clandestine recruiting organization set up by Air Marshall W.A. (Billy) Bishop. In addition, although there was no shortage of young Canadian aircrew recruits, American boys, attracted by the publicity given the BCATP, began crossing the border and lined up outside the nearest recruiting centres in such members that they caused some embarrassment to Canadian authorities. Occasionally they were followed by worried parents who, sometimes successfully and sometimes not, pleaded with them to forget about foreign wars and go back to school. Eventually, President Roosevelt gave his blessing to this mass exodus and ordered that Americans going to Canada to join the RCAF or RAF be granted exemption by the draft board. After Pearl Harbour 1759 American members of the RCAF transferred to the armed forces of the United States, another 2000 transferred later on and about 5000 completed their service with the RCAF. If any criticism is to be made of the BCATP it is simply that it was too successful. By the end of 1943 it was running like a well-oiled machine and turning out pilots faster than they could be absorbed into operational squadrons. In February 1944, after consulting with British authorities,Air Minister Power decided that the scheme must be slowed down. When the brakes were applied there were still thousands of recruits in various stages of training and they were jolted and jarred like passengers in a railway express that suddenly grinds to a halt. To their dismay and discouragement those anxiously waiting to begin flying training were told they were no longer needed as pilots. Courses just begun were canceled and the trainees given the choice of transferring to another category of aircrew for which there was still a demand, or joining the army or navy or taking their discharge. Student pilots who were well advanced in their training were allowed to continue but understood that they had little chance of being sent overseas and might be released at any time. Only the instructors, freed from their training duties and given priority in overseas postings found reason to rejoice.